No board game maker has made the jump to the digital realm quite as successfully as Days of Wonder. On Thursday, the company will, for the first time in seven years, release a new digital map to its players across multiple platforms, along with a handful of updates to the game on the iPad, including achievements, Retina graphics, and new AI opponents for specific maps. The new map, Legendary Asia, was first released as an expansion for the physical board game in December 2011. 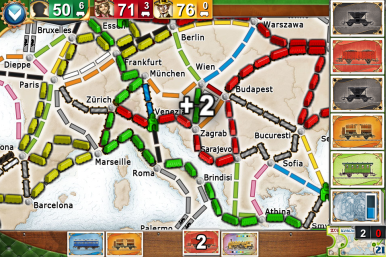 Not only does the $4 in-app purchase cover a brand new geographic region, but it also adds multiple new elements to the game, such as mountain passes that cost extra trains but net extra points, and an Asia Explorer bonus awarded at the end of the game to the player who’s connected the largest number of cities. Asia Pacific: The newest map for the popular railroad-building game is Legendary Asia. Days of Wonder has seen remarkable success with the digital versions of its games. The iOS versions—Ticket to Ride for iPad and Ticket to Ride Pocket for iPhone—recently passed a combined 1 million downloads. Part of that success has been due to wide availability: Not only are there iOS apps for iPad and iPhone, but the company also offers a Mac version (available via the Mac App Store and now on Valve’s Steam service), a PC version (also available via Steam), and a browser-based version hosted on the company’s site. The company has also committed itself to continually improving its offerings, based not only on customer feedback, but also on how they see the games actually being played. After the first release of Ticket to Ride Pocket, a vocal group campaigned for the addition of asynchronous online play. By seeing how people play its games, Days of Wonder can figure out what works. For example, the iPhone version of the game included Game Center achievements. “Achievements for solo play on iPhone were very popular,” said Hautemont. That provided an impetus to add achievements to the iPad version of the game in the latest update. In-app purchases are also a big part of Days of Wonder’s model with Ticket to Ride. Legendary Asia is only the latest in a line of expansions for the game. The iPad version ships with a U.S. map, but also offers other boards for Europe and Switzerland, as well as alternate versions of the basic U.S. game. European tour: The classic Europe map has been released a separate app for the iPhone. On the iPhone side, the company has done things slightly differently. For example, rather than make the popular Europe map an in-app purchase, Days of Wonder recently released the board as an entirely separate app for $2, with an in-app purchase option of the Switzerland map for another dollar. That sort of splintering has seemed to pay off for Days of Wonder in the past, allowing it to strategically differentiate its products based on how people use them. 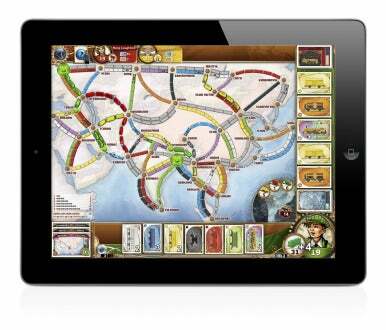 The company priced the iPhone version of Ticket to Ride lower than its iPad counterpart—$2, as opposed to the iPad version’s $7—and Hautemont believes that sales of the Ticket to Ride Pocket influenced sales of the iPad version, which saw an increase in the wake of the iPhone version’s release. Ticket to Ride isn’t the company’s only popular title. So far only one other, Small World—the company’s second best-selling physical board game—has made the jump to iOS, though it hasn’t been updated in almost two years. The company would like to update it, Hautemont said, and he suggested fans stay tuned.